Varied forms of artwork are part of the Artists from the Fringe show and sale at the library's program room through June. Work by local art collective Artists from the Fringe is being showcased at the library’s program room throughout the month of June. The group is made up of homeless people who have been meeting every week at a drop-in program called Art Jam. They meet Sunday afternoons to create art, collaborate and inspire each other’s work. This is the sixth show that the group has put on since starting almost three years ago. The group comes together to get a chance to create, and to put aside the challenges that they face every day. Lynne Johnson is the coordinator of Art Jam. She started the group after volunteering two winters in the seasonal shelter. “The second winter, I noticed that everyone was stealing the paper from our clipboards and drawing on them. I went out and bought a whole set of coloured pencils and got a stack of computer paper for them to use. Before long there were all these drawings that we put up all over the inside of the shelter,” she said. In the last few years, she has gotten funding for food, and has added a foot care specialist to help the group members. The program gives the participants a sense of community and belonging. “They’ve become a tight knit group. People come and go… There’s always one or two who stay. I now have an email list of over 50 people who have come through the program who are still attached one way or another,” Johnson said. The biggest hurdle for Art Jam participants is respect. By participating in Art Jam, the artists become more than just people who live on the streets. Nicholas Jewell, one of the artists at the show, said that the art does not necessarily reflect the outward appearance of the artist, but rather offers a look within. Jewell’s own work is abstract. He uses various colours and techniques to create visuals that invite the viewer to bring their own interpretation. While he doesn’t always go to Art Jam to create, he often gets inspired by the work of the other artists there, he said. All of the artwork at the show is for sale, with proceeds going to the artists. 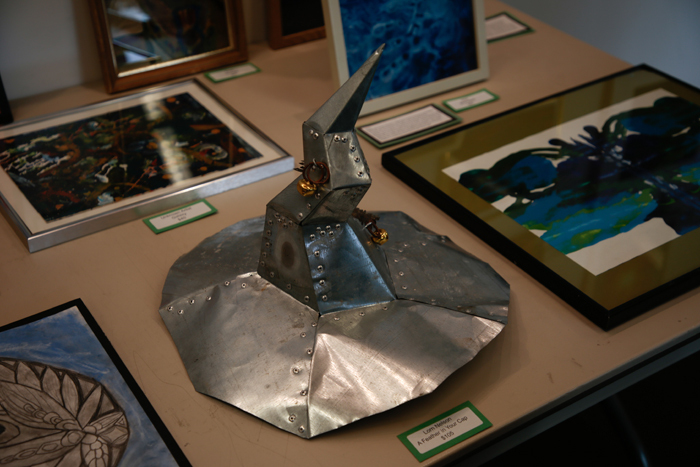 Pieces range from paintings to sculptures, and are all made by members of the group. While there is no cohesive theme to the works, they do provide a deeper look into the lives of the artists. To Jewell, the diversity in the art is part of the attraction. For more on this story, see the June 6, 2018 issue of the Gulf Islands Driftwood newspaper, or subscribe online.